Tanya Draws Illustration and Design: New Look at Zazzle & Blogger! New Look at Zazzle & Blogger! Hello everyone! After a while of inactivity, I have decided to start fresh with a new blog design that matches my new Zazzle Storefront! I opted for two of my favourite colours for this fresh, summer / spring look. See my Zazzle Storefront Here! While I have been inactive on the blog front, I have been busy with working full time along with adding new products to my Zazzle, DesignByHumans and RedBubble shops! I have been focusing a lot of my efforts to my DesignByHumans shop lately because I do really well there, however I would like to start dividing my time between Zazzle again because I have TONS of patterns that would be suited for the wide variety of products there. 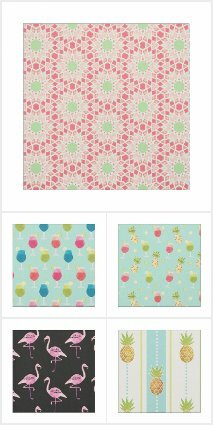 On My Zazzle shop I have decided to start updating my fabric line with new patterns. I have a beautiful pastel line coming up, and have recently added a purple ornate pattern collection and updated my summer time fabrics collection with some new patterns as well!